I was up in my attic craft room/office last Friday morning prepping blog posts, as you do, when the Senior Partner yelled (it's a big house) up the staircase "We've got another visitor - I'm off to the farm"! Grabbing my iPhone I ran (walked steadily) down three flights of stairs to see who it was. Remember the heifer that jumped the fence two weeks ago to munch on our lawn? A little while later "the Farmer" and his cowman arrived to assess the situation. A walk of the perimeter revealed just one place where she could have jumped the fence this time and the decision was taken to return her to the field via the same route. She didn't want to leave as you can see in the mosaic below. Meanwhile her herd mates took notes. I recently changed the hours of MM to offer the chance of linking up on Sunday rather than on Tuesday. From what I've seen so far that doesn't seem to suit your schedules as much as I hoped it would. So, my question to all MM'ers is shall we go back to Monday 7.00 am to Tuesday 7.00 pm (French time) or stay with the new timetable? Either way works for me so please let me know which you'd prefer. This cow makes the saying true "The grass is greener on the other side of the fence." Funny she is! To me both times are ok. Thanks for your input & for joining in with MM again this week. Maggie, your little lady visitor has a mind of her own. She obviously feels the "grass is greener" on the other side of the fench. I'm going to send you a photo of a painting we've had for decades. 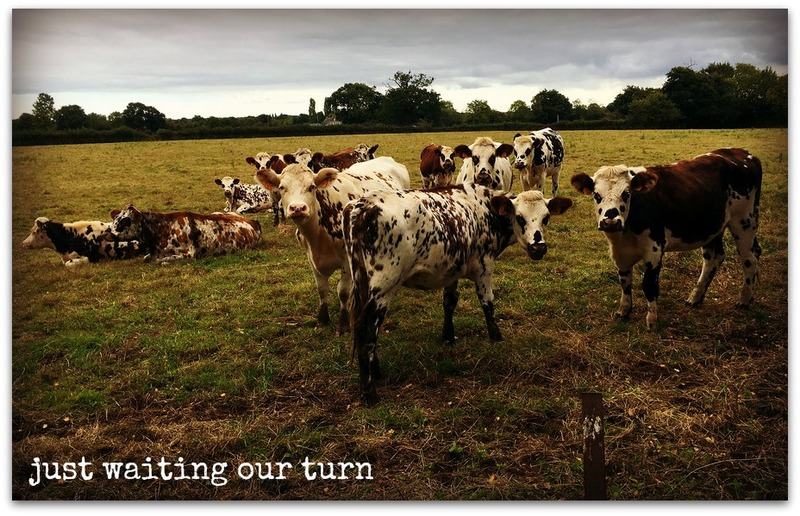 Your last photo could have been the inspiration, and yes, it is titled "The Grass is Greener". My friend with the two miniature donkeys has had to deal with an escape issue this summer. Seems her two figured out a way to hop over the fence, and they were found wandering the busy streets. Long story short, they were arrested and taken to "donkey retention". She had to pay a fine, hire someone to haul them home, and spend an excessive amount to have a new donkey proof fence installed immediately. It was amusing, but expensive! As far the start time, I personally like the change to Sunday. It's much easier for me. Have a great week. By end of the week, I'll be enjoying the delights of France. Wish I was going to see you!!! I giggled at "her herdmates took notes"! She is a lovely visitor. I like your Sunday start to MM. Whatever is easiest for you! Thank you, Maggie! That pretty little cow visiting again made me smile Maggie. Wonder if there will be a part 3 ! The group watching may have figured something out, herd visiting mabye. Thank you for your 101st Mosaic Monday. Either day is fine for joining in. Hae a great week. 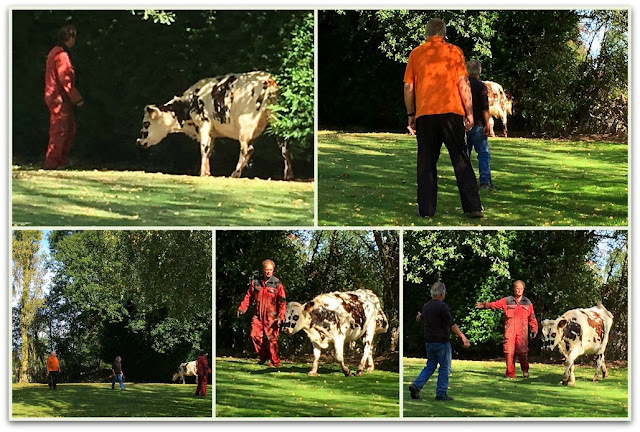 I am sure it was not funny at the time, but I was quite amused by the pictures of the team trying to 'herd' the heifer … How many men does it take to herd a cow? LOL. As to your question - either time frame works for me, and thanks as always for hosting! That pretty cow loves your yard! Do you think you should adopt her? 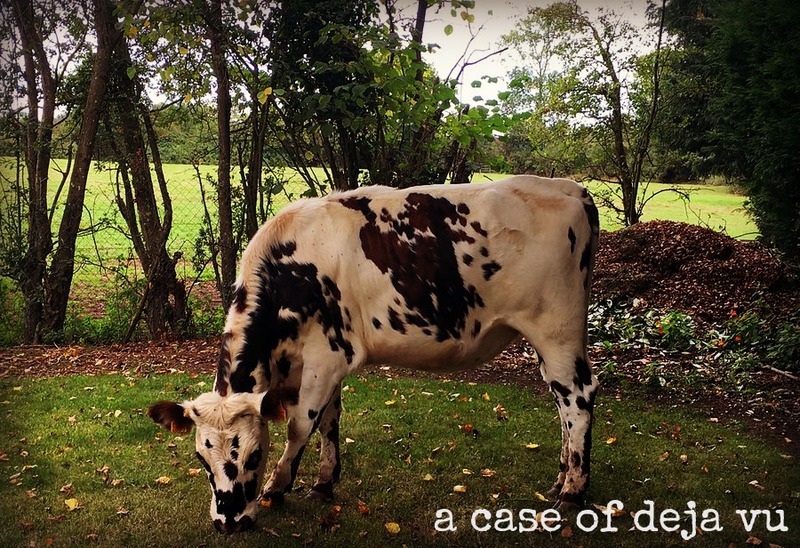 We once stayed overnight in an RV Park some people had built on their farm and one of their cows got loose and was wandering among the RVs, tromping on barbecues and picnic tables. It took a whole group of people to round her up too -- guess she wanted to be with all the traveling folk! Sure was different kind of entertainment for us! I like the new time especially when we are here on the West Coast of the US , but I can work with either one. Thank you so much for providing the opportunity to share and visit so many great bloggers! The cow seems to be adventourus. And she likes your garden area, dear Maggie. It’s funny to read. I agree with the majority to decide a new time for Mosaic Monday... and thank you for hosting! I like the new Sunday beginning to MM, as Monday mornings are always hectic for me, but please do what is best for you and thanks so much for hosting every week!every week! What a cute visitor - good news the rest of the herd did not follow! I'd love the link up until Tuesday, I often miss out because I'm too late! That grass is too lush to go to waste - she just could not resist! Monday suits me best. Thanks, Maggie. Monday is fine, but can work with what you decide, Maggie. 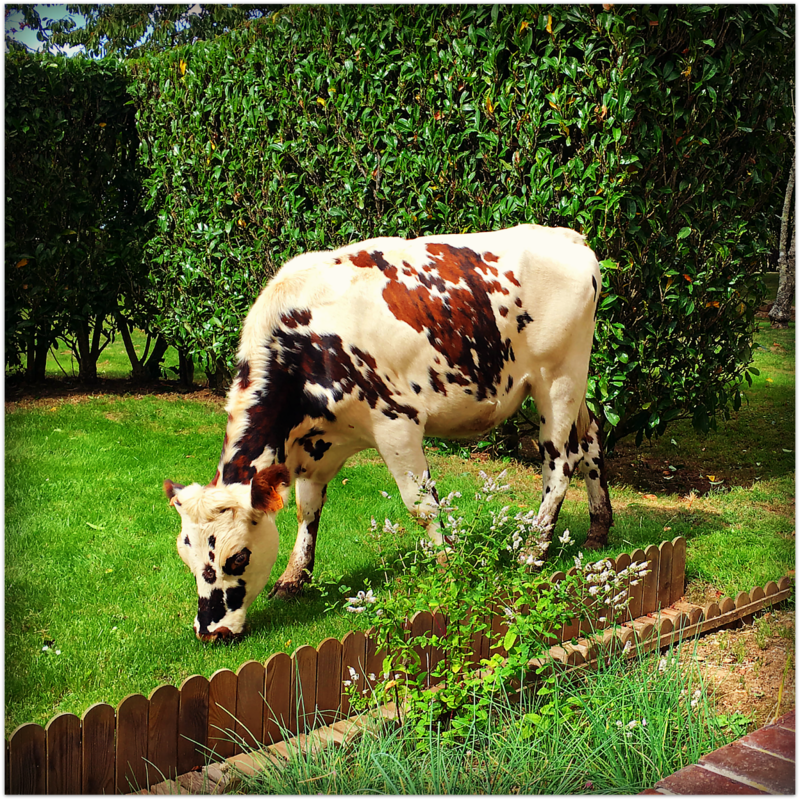 The heifer obviously enjoys your lawn so good luck with keeping her out and not inviting the rest of the herd in. I prefer Monday to Tuesday, as I don't always get my posts finished in enough time. Just snuck in by a few hours tonight. Thanks Maggie. Have a fabulous week. That's one determined vache! She likes your garden! I'm okay with either time, although I do like being able to post earlier on Sunday. I intend to get a post done on Saturday, but that doesn't happen too often. Thanks for hosting, Maggie. I thought your unexpected visitor might be a wayward guest or lost soul. I suppose she was! Well, I totally forgot to even post last week Maggie...huge sigh...but I like Sunday/Monday posting time...hence Mosaic Monday gives me my helpful hint to post...usually. If I have nothing to post that week, I at least try and get to stop by later in the week.